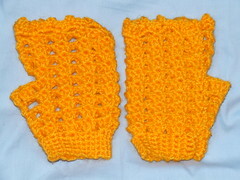 On the UK RAK group on Ravelry, we have started a monthly game where, every month, we agree to send a RAK parcel to a partner on a specific theme. The theme for March was 'Yellow', and I decided to make three of the things in my parcel. It was only when I put them together that I realised how different the colours were, and how each colour affected the others. 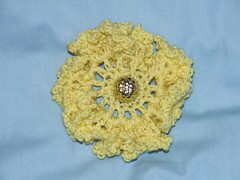 This really is yellow - just photographing it on a blue surface is making it look greenish, but I can assure you it isn't! 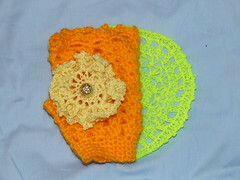 ....at which point my yellow items became a cream flower, orange mitts and a green doily. I love colour, but it drives me mental! I wish I'd put my sunglasses on *before* I read the post! Glorious colours! 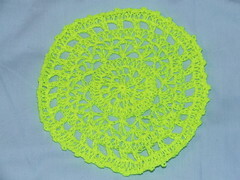 They represent spring and summer and sunshine.